Aleksandar Mitrovic who joined Fulham at the start of the 2018/19 season is already at the verge of joining West Ham, who are ready to make an offer if the Cottagers end up being relegated from the Premier League by the end of the season. Aleksandar Mitrovic joined Fulham at the end of July 2018, when he moved from Newcastle for a fee of 20 Mill. € after proving his worth during a 4 months loan at Fulham. During the time he was at Fulham on a loan he helped the Cottagers with 12 goals, which was enough to secure their promotion into Premier League. 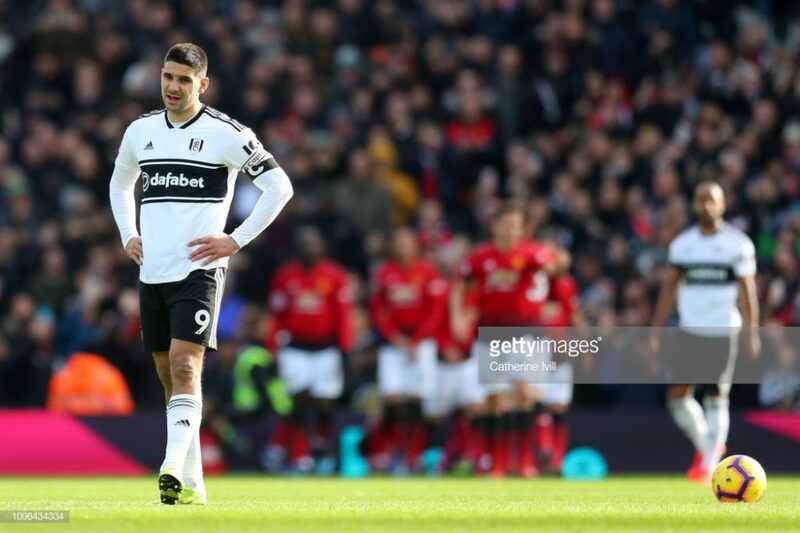 But the Serbian striker is unlikely to continue his campaign at Fulham if they fail to avoid relegation this season, which seems highly likely to happen. As it stands now, Fulham are 19th in the Premier League with a 4-5-22 record and 13 points from escaping the bottom three. While there is still a hypothetical chance for them to escape the relegation zone, it is highly unlikely to happen especially with their terrible form of 1-0-11 in the last 12 matches. With that in mind, West Ham are already preparing to sign the Serbian striker who has impressed at Fulham, however, his contribution to the team was not enough to keep Fulham’s boat afloat. As it stands now, it was reported that the Hammers attackers Lucas Perez and Andy Carroll are their way out of the club, which is why the signing of Aleksandar Mitrovic just might happen, if of course, other teams don’t get in the way. If the deal ends up going through, West Ham needs to be ready to open their wallets as Aleksandar Mitrovic won’t be cheap. With 10 goals and 2 assists this season for Fulham, he has an estimated market value at £22.50m, however, Fulham will most likely ask for more especially if more clubs express their desire to buy him. At that point, we are talking about a lot of money and the Hammers need to decide if Mitrovic is worth spending upwards to £30m. After disappointing performances from Perez and Carroll, they cannot afford to spend a lot of money on another player who can’t do his job. Andy Carroll scored only 1 goal in 14 appearances, while Perez did not perform much better with 5 goals in 15 appearances, only 2 of which he scored in the Premier League. With that in mind, West Ham are in desperate need of some fresh legs up front who can produce goals. They have got a great lineup in the midfield which can feed the ball to the front (Nasri, Anderson, Lanzini), the only thing they are missing is a good goal scorer, which exactly what Mitrovic is. While I don’t believe money will be an issue for West Ham, it will be Aleksandar Mitrovic who will need to decide which club he wants to join. After what he has shown at Fulham his price tag is quite high, however, it’s deservingly high. He played exceptionally well in Fulham, so we can only imagine what he will be capable of in a better team like West Ham. At the end of the day, I could easily imagine him wearing West Ham jersey, as they are a good club with European competition ambitions and could provide a great opportunity for Mitrovic to grow as a player. They are basically a perfect club for him. West Ham needs strikers and has players who can provide Aleksandar Mitrovic with the ball to do what he does best; score goals. In addition, Aleksandar Mitrovic could join Marko Arnautovic up front which could prove to be a deadly duo with great chemistry. While the transfer is nowhere near to be done, we can expect Aleksandar Mitrovic to end up in West Ham, that is if we won’t see any other big club expressing their desire to sign the Serbian, which could persuade him otherwise.